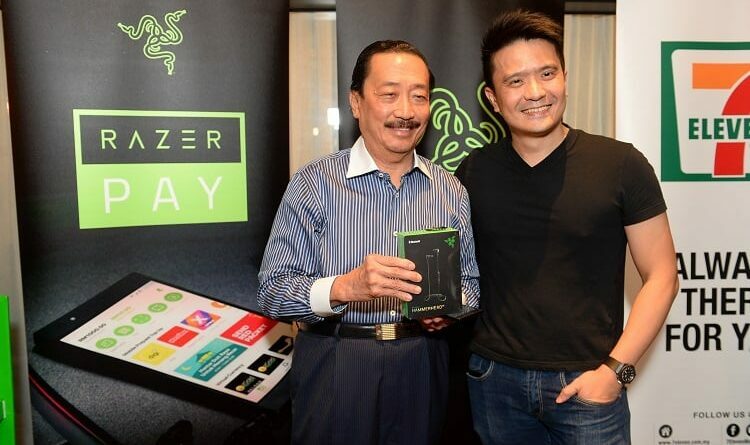 (L to R) Co-Founder & CEO of Razer, Min-Liang Tan and Tan Sri Dato' Seri Vincent Tan, Executive Chairman of Berjaya Corp.
Razer, the brand usually more known for its gaming periperals has now entered the e-wallet business in Malaysia with Razer Pay. The service is through a partnership between Razer and Berjaya Corporation. Designed for youth and millennials, Razer Pay aims to allow users to top up easily, transfer money quickly, and pay everywhere. Razer Pay can also be used for online transactions. For example, users who love games and video entertainment can purchase PIN codes instantly for popular services such as zGold MOLPoints, Steam Wallet, Garena, Sony PlayStation, Spotify, iflix, Astro NJOI and more. At the same time, prepaid mobile customers can also choose to top up their accounts with Razer Pay if they have an account with Malaysia’s top telcos – uMobile, Digi, Maxis, Celcom and more. Over 6,000 major retail and F&B outlets will accept Razer Pay, with participating brands such as 7-Eleven, Starbucks, Singer, Cosway, Greyhound Café, Wendy’s, Kenny Rogers, Krispy Kreme, 99 Speedmart, Tealive, Thundermatch, Sweet Hut and more. Razer Pay will grow its merchant network rapidly to encompass F&B, healthcare, travel and other lifestyle services in Malaysia. To celebrate the launch of Razer Pay, every new user in Malaysia will receive RM10 bonus credits when they sign up in the Razer Pay app from 4 July to 30 September 2018. To get started, download the Razer Pay Malaysia app from the iOS App Store or Google Play Store. Upon successful sign-up with a valid local mobile number, users will receive RM10 bonus credits to spend using the app. The credit is non-transferable, cannot be exchanged for cash and will expire after 90 days from account activation. Download Razer Pay now from the iOS App Store or Google Play Store. For more information, click here. ← Art and Comic Fans, It’s Time for VAX2018!